Get a thing all back-asswards elbow-wise, bang on and on about it, change my mind and then have to start all over again. That’s my métier. I just, as a young man, did not “get” Shirley MacLaine. At the time I was getting into cinema she had just starred in the transcendent Being There which I loved, but in the same decade she was in the easily resistible Terms of Endearment, Steel Magnolias and Cannonball Run II. It was hard to see what all the fuss was about. And let’s not even start on the occultism and spirituality. But as with Elizabeth Taylor, whose appeal also initially passed me by, I eventually had to execute a clumsy, public volte-face. Liz I had written off as a gaudy, pie-damaging barrage balloon. Then I saw her in Giant and Cat On A Hot Tin Roof and things began to make more sense. As with Liz, so with Shirley. The kooky dame in the bad films became somebody else entirely to me once I saw her throbbing bruise of a performance as the elfin, vulnerable, scrappy Miss Kubelik in The Apartment. Scales. Eyes. Damascus. All of that. 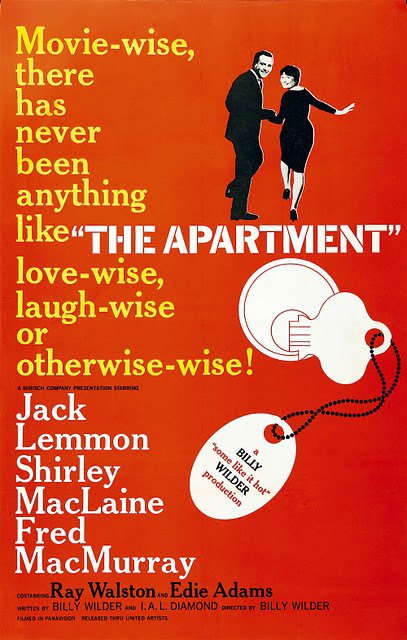 The Apartment was Billy Wilder’s first film after the box office behemoth Some Like It Hot and expectations must have been pretty high. 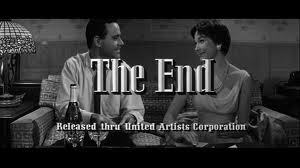 The Apartment certainly performed very respectably in financial terms and won a fair few Oscars as well. Nerds will already know that it was the last black and white film to win the best picture award until Schindler’s List thirty-three years later. So it packed them in OK, but I wonder what contemporary audiences made of it. As this image of the poster shows the movie was sold as a comedy, but the bleakness of some of the story’s content must have induced at least a bit of dissonance in the people watching it. In this respect it reminds me of the bludgeoning campaign a few years ago for Slumdog Millionaire in which the film promoters enticed would-be ticket-buyers with the promise of a feelgood, singalong, family romp. The car-battery torture sequences were under-emphasised. Wilder was never deterred by the seamier side of life. The Lost Weekend is as excoriating a depiction of alcoholism as you could wish for. Ace In The Hole still has a lot to teach us about the nature of the relationship between reporters and the reported. And Double Indemnity remains a spectacular illumination of the weakness of men in the presence of beauty. Even high-concept comedy Some Like It Hot starts with what appears to be the St. Valentine’s Day Massacre. There is certainly an underlying sardonic wit to a lot of The Apartment, but the actual events depicted in the plot (sexual harassment, workplace bullying, attempted suicide) are not themselves that funny. It’s a bit of a stretch to call it a comedy. Jack Lemmon plays C.C. Baxter (C for Clarence, C for Clifford) better known as Buddy Boy, an insurance company worker who allows his apartment to be used by his office superiors for extramarital liaisons. The downside is that he frequently can’t use his own home and that his neighbours regard him as an indefatigable party monster. The upside is that the favour he has curried with his bosses secures him professional advancement. 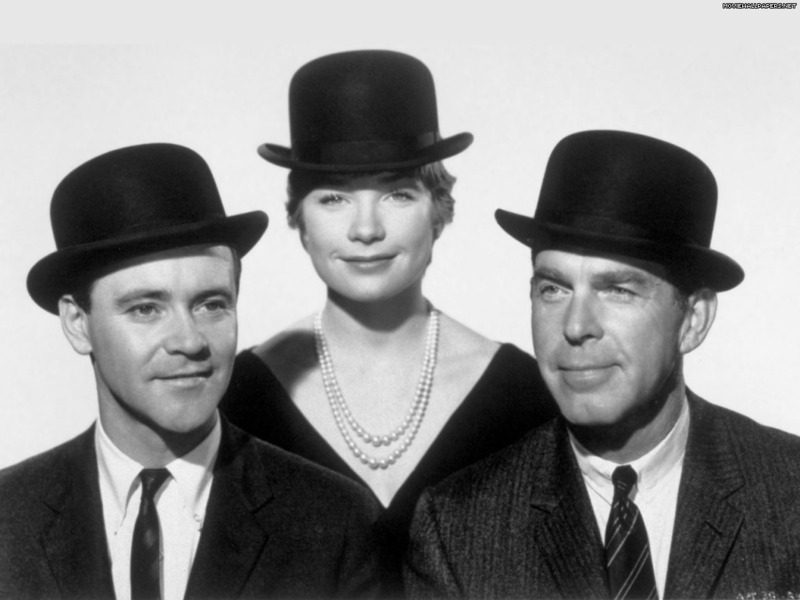 This all changes when Baxter realises that the lift girl (MacLaine) he is infatuated with is being ruthlessly strung along by his boss Mr. Sheldrake (played with sinister, avuncular brilliance by Fred MacMurray). How much are we prepared to sell ourselves for? This seems to be the question that the film (scripted by Wilder himself and long term writing partner I.A.L. Diamond) is asking. Baxter’s own personal enlightenment and subsequent Scrooge-like conversion follow as a result of seeing Miss Kubelik’s unshakable moral rigidity in action. It’s dead good like, and I am always an emotional wreck by the time the movie’s justly famous last line rolls up. That this works so well is secondarily dependent on the scalpel-sharp writing and the eminence of the supporting cast, but the principal strength, the axis about which all else revolves, is the utterly brilliant performance Jack Lemmon turns in. The guy was a genius. I still can’t believe we lost him over ten years ago. Lemmon’s reputation is chiefly as a comic actor, and this is understandable. His lightness of touch in this, Some Like It Hot, The Odd Couple and countless others is the stuff of master-classes, but I’m convinced he only had that comic authority because of the magisterial straight acting ability he possessed. His performances in The China Syndrome, Days of Wine and Roses, Missing and Glengarry Glen Ross showcase this pretty convincingly. Hell, he’s even the standout in Airport 77 (sharks on a plane) as far as I’m concerned. It’s crucial to the success of The Apartment that we love Baxter unconditionally despite being able to see how much of a supine twit he is being. Nobody could carry this off the way Lemmon does. Neither could anyone else be quite so accomplished doing the business with the hat: “it’s what they call the Junior Executive model”. The Apartment was made a short five years before I was born but, Canaveral and Castro references notwithstanding, this feels like an artefact from another era. Seven years after The Apartment was made Bonnie and Clyde was released and Hollywood power shifted to a younger cadre, generally less concerned with narrative complexity and ambiguity of character. Lord knows I love the Easy Riders, Raging Bulls generation, but this kind of film is where my main allegiance lies. If you are emotionally tough enough for the pummelling you have to take to get to the end titles you will find the pay off well worth your time. A fabulous film, Christmas-wise and otherwise-wise. Enjoyed the review! Hmmmm. I think I need to watch this again. When I saw it before, (on TV) my experience of the film was colored by my reaction to the subject matter. I didn’t, and probably still wouldn’t, think it should have been called a comedy. I remember feeling like I’d been misled into watching what I thought was going to be a light-hearted film, and then being whacked with a film about workplace and personal relationship manipulation. An attempted suicide over being used emotionall and physically – yup, hysterical. I got really ticked off. So yeah, maybe it’s worth a rewatch with my righteous indignation turned down to low. That was precisely my experience with Spongebob Millionaire. I was a furious scrunched up ball of rage in the cinema, angry at the audience who were laughing at stuff that wasn’t remotely funny because they’d been conditioned to expect a comedy. It totally dominated my experience of the film. I’ve never seen The Apartment other than by myself. First time through I looked askance at the stuff you talk about. Second time I got won over by the writing and performances, particularly Jack. Now I just blub like a lunatic because I know what the characters are going to have to go through to get to the end. I’ll give it another shot.